Concrete pools decks have been a popular choice for many years because of the low cost of concrete. 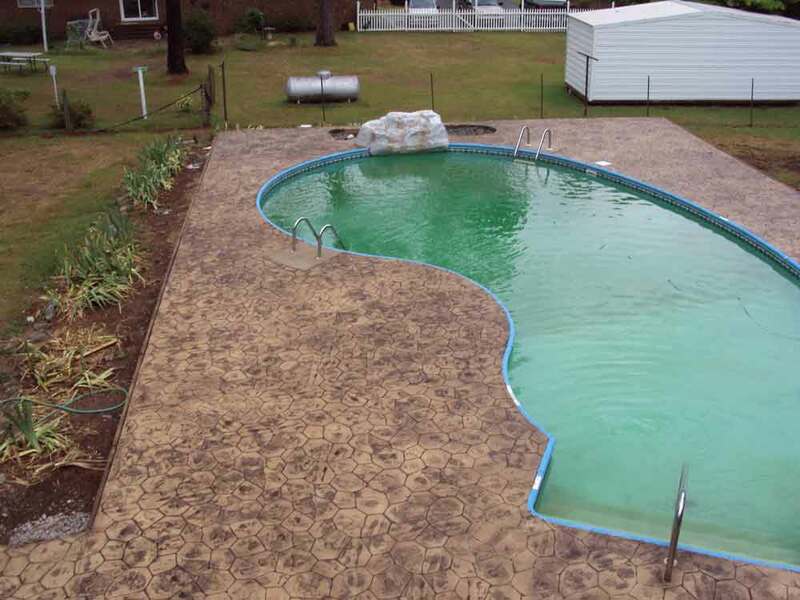 It is definitely true that choosing a concrete pool deck will be cheaper than using tile or stone. In addition, concrete has become more versatile in recent years. You now do not have to sacrifice style for substance in choosing that type of material. We are professionals that work fast and efficiently to give you the best results. We have the right equipment and training to do the job in ways that leave customers happy. 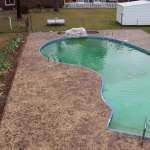 By choosing We Do Concrete Cheap, you are guaranteed to get a beautiful decorative, stamped, colored, stained, and/or sealed concrete pool deck. 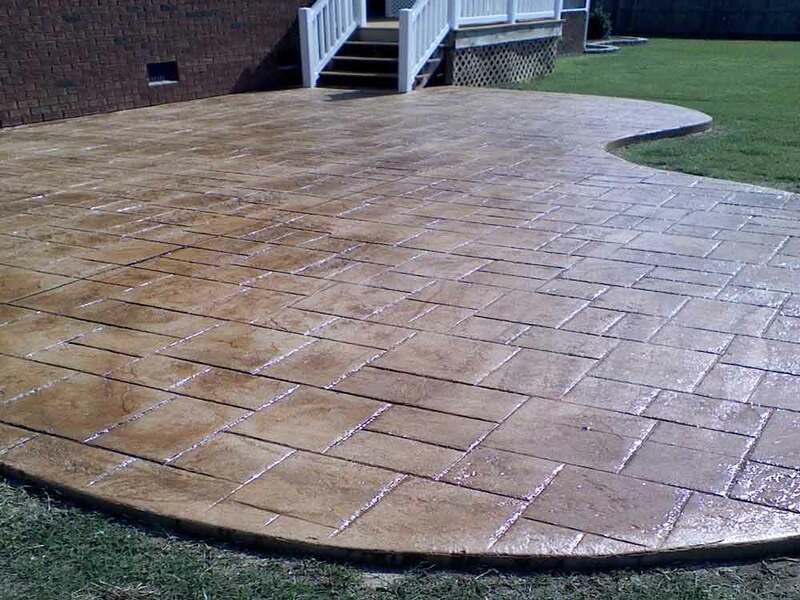 With our decorative stamped concrete, let's just say your pool area will be styling. 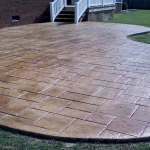 The choices in designs with stamped concrete are vast and you will surely find one that you want. Another advantage of stained concrete is that you can get that stone, brick or wood appearance while still having the benefits that concrete offers. People generally want the pool deck to be an extension of the style of their home or yard, and getting a stained concrete pool deck makes that achievable. 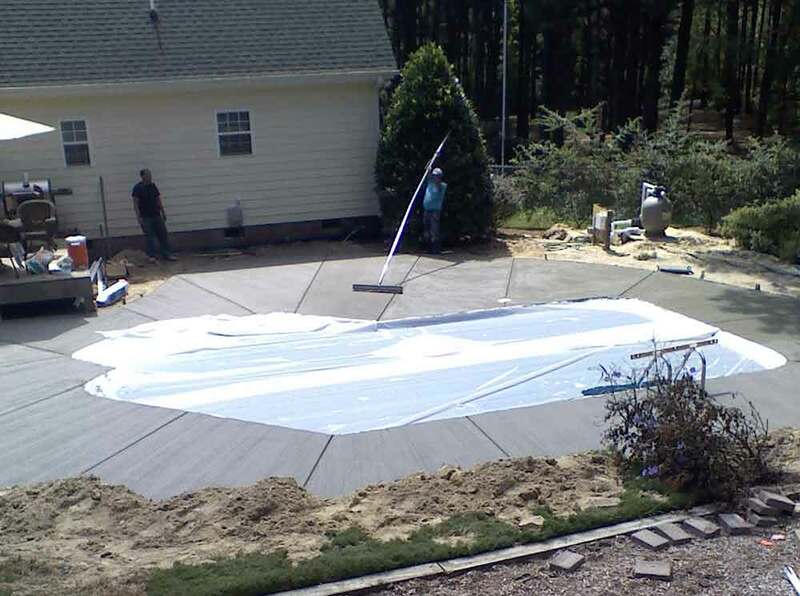 Concrete is slip-free, and this is most important in the areas around the pool. When you have kids running around the pool, parties-or just at any point that anyone is around the pool-safety is number one. Stamped concrete pool decks are also much easier to clean than any other type of surface that can be used around the pool area. The pool is a gathering spot in which people like to enjoy food and drinks. You should be able to relax without worrying about ruining your pool deck. You don't have to worry about staining with concrete. Even pool furniture around your deck won't chip the concrete when those chairs or tables are moved around. The benefits of concrete over wood, stone or brick go beyond cost when choosing a pool deck surface. Concrete pool decks are extremely durable. They are resistant to the sun, something that is bound to happen during the summer when people swim. This allows you to walk around on your concrete pool deck without feeling like your feet are on fire. This is especially important if you have children or don't want guests to have to worry about wearing flip flops when walking around the pool. 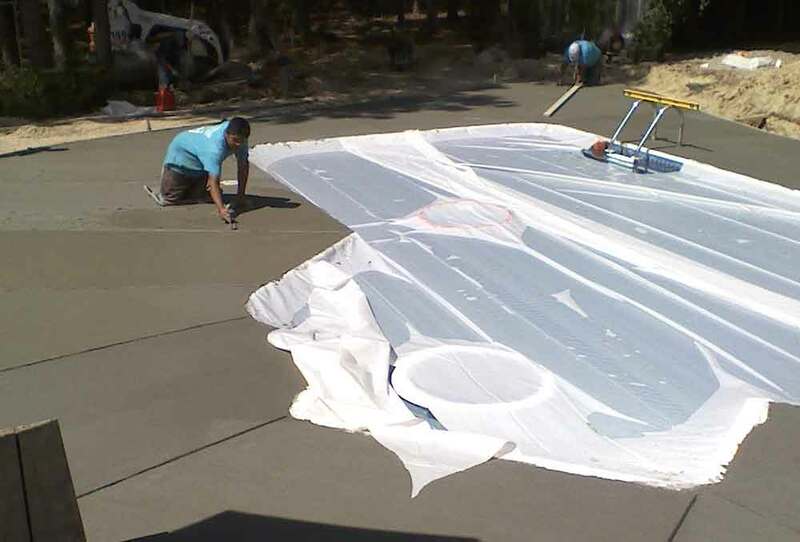 Accidents can be greatly reduced by having this type of concrete around your pool. Water is the obvious factor with any pool deck, and concrete is the best solution for that because it is one piece and has no seams. Also, water damage, cracks, splintering, rotting or weeds won't be an issue. Decorative concrete allows you the ability to select any size, shape, color and surface treatment for your pool deck – you can get the appearance of almost any exotic material. You can also mix and match decorative treatments. 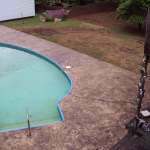 And if you currently have a concrete pool deck that is looking worn down, we can solve your problems with a refinishing such as exposed aggregate. We can also add elaborate appearance to your current pool with some decorative curbing – even small touches can improve the entire look of a pool deck. 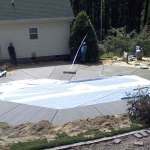 At We Do Concrete Cheap, we will work with you every step of the way in creating a customized look for your pool deck. Whether you want a decorative, stamped, colored, stained, and/or sealed concrete pool deck, we can assure you will be satisfied with the results. We don't trade price for quality. We offer the cheapest rates around, while giving you the quality of paying a higher price! 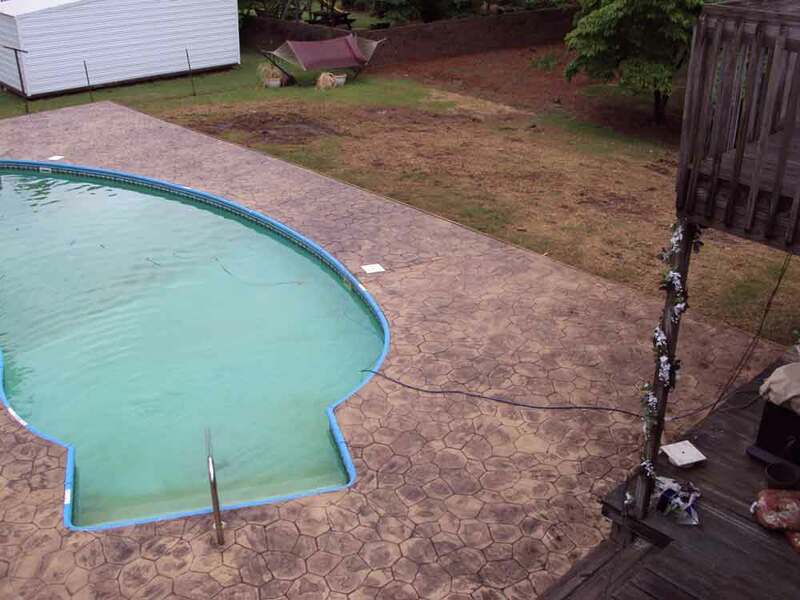 If you are interested in a free estimate on a beautiful concrete pool deck or have any questions, please call We Do Concrete Cheap at 919.454.3927 or fill out our CONTACT FORM.